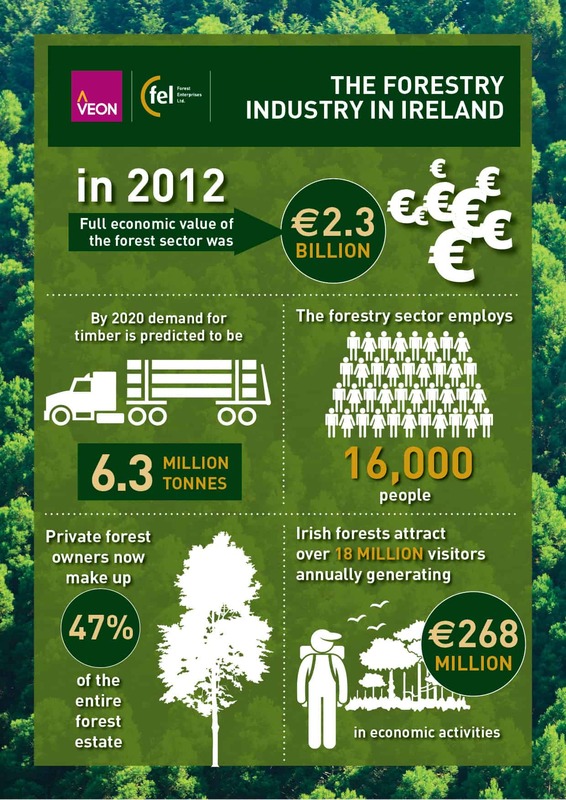 An infographic on the Irish forestry industry - Veon Ltd.
Forestry is a vital resource for the Irish economy. The forestry sector contributes €2.3bn to GDP annually,employs 12,000 people and generates annual exports of over €350 million. The economic activity of the forest sector is spread through every region of the country and makes an important contribution to regional development and rural employment. Forestry is the largest outdoor recreational activity in Ireland, with over 18 million visits to Irish forests per year. Ireland possesses some of the most productive forests in Europe, with yields up to five times greater than northern European countries. Irish forests currently produce 3 million tonnes of timber per year with numerous uses for wood products. In 2016, exports of forest products from Ireland were valued at €350 million. By 2020, the annual production of timber from Ireland will be 6 million m3. Demand for timber outstrips supply by 1.7 million tonnes.